Architecture historian and critic Sylvia Lavin gave an impromptu lunchtime lecture today on EAT's Pepsi Pavilion. Built from a retrofitted geodesic dome for the 1970 Osaka Expo, and filled with a spherically-shaped reflective mylar interior, EAT's pavilion is normally understood as a media experiment. Its various interactive devices, displays, atmospheric effects made the pavilion as something to be considered by art and media historians, but not by architecture historians. This presented a problem for Lavin, who used the case of the Pepsi Pavilion to make a greater case about the objects of architecture history. After all, EAT's project had some formidable art and architectural pedigree: principal Billy Klüver not only worked on Andy Warhol's mylar balloons, but EAT member John Pierce designed the interiors for Paul Rudolph's apartment. 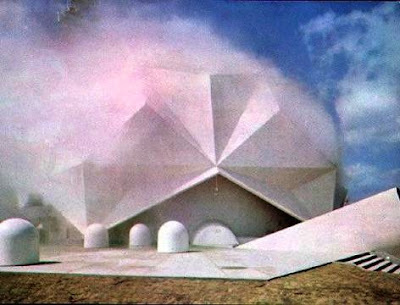 Thus the Pepsi Pavilion stands as an example of an object that is not canonical, that orbits in the periphery of architectural discourses, and that must be read against the grain of architecture history. Lavin reformulated the idea of center versus periphery in terms of psychoanalysis versus detective work: whereas the former finds the hidden, the latter looks for the hiding. In other words, the Pepsi Pavilion is hiding. 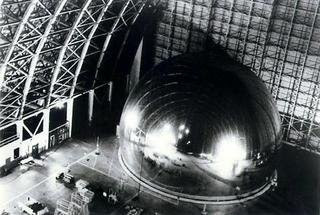 Engineers deployed a full-scale model of EAT's spherical mylar interior in a Marine Corps hangar in 1970 (above). The sphere subsequently tore and deflated. Yet EAT's test mylar sphere nevertheless becomes a provocative object in itself. The sphere recalls NASA's Echo Satelloons, a series of spherical balloons conceived as a part of a passive satellite system. Microwave signals beamed from the ground are aimed at the Satelloon, and bounce back to Earth. The first Echo satelloon perished in a launch second, and the second was eventually launched and tested in 1964 (above). Thinking about the similarities between EAT's mylar test sphere and the Echo Satelloons complicates Lavin's assertions on slightly. The connection between the two objects is, however, well-known. EAT principal Billy Klüver worked for Bell Labs, which was involved in the testing and design of the Echo satelloons. However, if we are follow Lavin's remarks and think of EAT's Pepsi Pavilion as an object in hiding, how interesting that, technologically-speaking, the Pavilion is a version of a broadcasting device. Think of it as an object in hiding conceived as an object for connecting millions of people. A very public thing becomes a rather private thing. It is if we stick to the idea that it is only architecture historians that consider the Pepsi Pavilion as an object in hiding. But perhaps the psychoanalyst-versus-detective paradigm forsakes the object by focusing too much on the process of interpretation. Perhaps then the role of the historian might be not to distinguish on the act of uncovering and detecting, but rather to test an object's own probative value. This means that an object operating outside the periphery of architectural discourse -- something like EAT's Pepsi Pavilion -- will likely prove a historian's assertion or allegation and lead to evidence that validates the historian's hunch. It probably involves a leap of faith, but as EAT's Pepsi Pavilion demonstrates, the move to include such an object within the normative realm of architecture discourse usually rests on a very, very well-founded assertion. It is too much to assume that such a model may undo the idea of center and periphery .... and perhaps this is restating the obvious, but it is at least a starting point. One other observation, psychoanalysis is more to do with repression and enforced hiding, not something that sounded more like shy objects in her lecture. If the Pepsi Pavilion has been hidden, it was not accidental. Perhaps it is not conscious, but it's not the Pavilion's volition here. Rather something about architectural history that ignored it, probably because it is neither ugly enough to be interesting nor attractive enough to be notable? That or it's not a psychoanalytic kind of hiding, merely that it was upstaged by other Osaka Expo architecture? Ok, one last thought, it seems that while both projects wear cloaks of fog on the outside, the interior of Blur and Pepsi are very different. One is still Maid of the Mist on the inside, and one is dark cave. No? Anyway, yet another delightful read. Thanks for stopping by. By "impromptu", I meant that she presented a very brief, off-the-cuff version of a lecture I had seen at Yale two years ago. But you are absolutely right when you say that the talk was "performative", and hence not "impromptu." I also think your take on the "hidden" object is also correct. When I think about why EAT's Pepsi Pavilion has been "ignored", I think of many other things that still remain in archives and why they stay there. In other words, there is probably a good reason why a particular project/building remains unknown, etc. Anyway, I am making contact to say hello and also to ask you how you find Princeton. I have been toying with the idea of a PhD for, oh, about eight years, and think I am now ready. I am an admirer of Sarah Whiting (She was among the jury members for my final thesis critique at Yale.) and Hal Foster. I'd like to ask: What do you think of a.) the program. b.) the financing. c.) the people d.) the area. Any insight you would be willing to share would be most appreciated. My area of interest includes Mies and Koolhaas and the act of writing about architecture. Wrote thesis on OMA's Campus Center at IIT. Hi Shari ... you can reach me at enrique[dot]gualbertoramirez[at]gmail.com. Thanks for stopping by! Rosemarie .... I just sent you a separate email. Nice to hear from you!